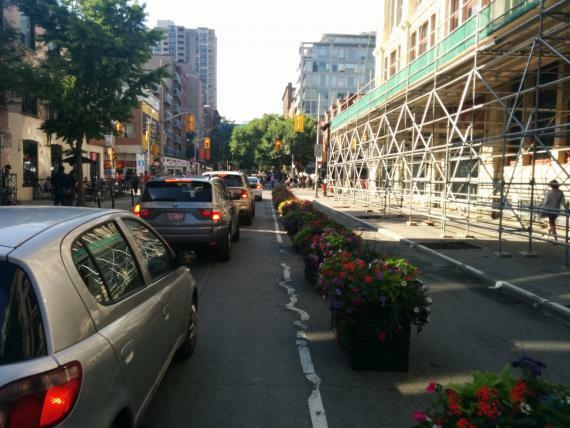 How long is Cressy willing to defend a flawed John Street design? David Stern, the owner of the Queen Mother Café—with support of a group of pro-cycling lawyers— has asked the province to reconsider the John Street EA in light of new information—namely a professionally-conducted traffic count—that shows that bike traffic is much higher than the 2% that was quoted in the EA. Cycle Toronto Ward 20 and the Toronto Bicycling Network have written letters in support. Read more about How long is Cressy willing to defend a flawed John Street design? Dave Meslin organized a bike count a couple days ago to find out if the John Street Corridor EA's 2% bike mode share claim was correct or not. I joined the effort. What we found out, and suspected, was that it was quite unlikely that 2% could be accurate. The EA claimed that cycling rates on John Street were a steady 2%, morning, afternoon, weekday and weekend.